I started having problems with my garage door opener a week ago. Long story short after thinking my problem was in the opener itself I ran an extension cord inside the house to the opener and to my surprise, purfect operation. So then i started looking elsewhere. Put a voltmeter in the outlet (overhead in the garage and the only thing on that circuit) and got a sporadic reading. Numbers all over the place. I took the receptacle out and touch just the wires and got a full 120. So I replace the receptacale and to my dismay problem still persisted. Opened the circuit breaker paner and noticed melted insulation of about 1 inch on a white wire attached to the bus bar. It looks like it is still connected and I assume this is my problem and why i am getting a sporadic reading. Now, I am an novice when it comes to electricity, but with this issue i might be an old pro. Two years ago the lights (power) in my bedroom/bathroom just all of a sudden went out After a couple days of troubleshooting I finally and terrifyingly opened the panel. Found a completely melted white wire on the bus that had melted through and lost contact. An electrician freined of mine walked me through the problem and I just cut behind the melted insulation stripped the insulation and inserted the wire to a new location on the bus bar. All was well. I also tightened some other screws i thougth were loose along the bus bar. Six months in I checked my work and everything was fine. Fast forwrd to today and to my surprise the same problem on a different circuit only not melted all the way through to lose contact. I think I know how to fix the problem, but my concern is do I have another major issue behind the scenes? Two melted white wires on the same bus bar in two years? Also, another screw on a different wire was loose and needed tightened. I know that two years ago I tightened all of them. What would cause them to loosen over time? I have never heard of this happening and it seems rare. Do I have a bad bus bar or something? Should I be concerend of a larger problem than just simply fixing my current issue? Like I said I am no electrician. But I am concerened that my novice eyes is missing something major. Any thoughts or concerens you can give me would be appreciated. I have pictures of the wire if you have an e-mail address i could send them to it might help with the understanding of my issue. We recommend that everyone have their electric box serviced once a year. I is not uncommon for screws to loosen up in an electrical box. Once this occurs you can cause damage to the buss bar. The heat the the loose connection had could distort the metal making future problem more likely. Also the heat can cause circuit breaker to go bad. We call this service a panel tune up. 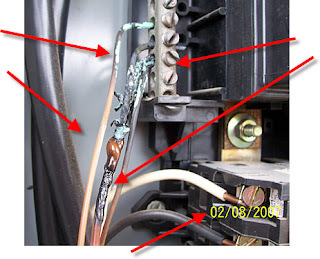 I would recommend that you call an electrician to do a safety check on your electrical box. You could be over looking something. Its very possible that the original poster has aluminum wiring. that is why he has had several wires start to melt. He didnt state how old the panel is.